The term neuromusculoskeletal system can be simplified into a term used by the first Chiropractor called the “neuroskeleton”. DD. Palmer refers to our spine as the neuroskeleton because it has the special role of protecting and promoting the function of our central nervous system (CNS). The CNS is comprised of our brain and spinal cord. Optimal function is the aim. Living our potential is the aim. In fact, many elite athletes (Kelly Slater, Michael Jordan, Venus Williams…) utilise chiropractors and performance is how these athletes base their living. You don’t have to be an elite athlete to notice the benefits of chiropractic care; we love to see people from all walks of life, as we love to be a part of a thriving community throughout the ages and stages of life. Our chiropractic team at Zuma Health focuses on gentle care & the techniques that are designed to listen to your body & nervous-system through comprehensive analysis. We work to restore optimal function to your spine. We use spinal alignments/adjustments because of the direct relationship your spine has to its nervous-system. The manual and soft tissue techniques used in our chiropractic care can help to correct physical misalignments, improving muscle tone and stimulating nerve activity. * These adjustments restore spinal function and in turn this re-establishes a more supportive connection between your mind and body. Spinal alignments have been used as a healing technique for thousands of years in many cultures throughout history. The modern version was developed in the late 19th century. Chiropractic is recognised as a genuine health care approach and many published research studies demonstrate it is effective for people with a range of spinal - health issues. Chiropractic takes its name from greek language meaning chiro (hand) and Praktik (Done) meaning done by hand. Scientific studies have shown chiropractic can be helpful to assist with numerous neuro-musculoskeletal conditions. When interference is removed through better spinal health, the spinal cord is able to more effectively transmit information from the brain via electrical impulses and neurotransmitters to the body. These impulses direct other organ systems in our body to moderate and balance hormones and biochemical feedback thereby establishing a more effective homeostasis or physiological balance. 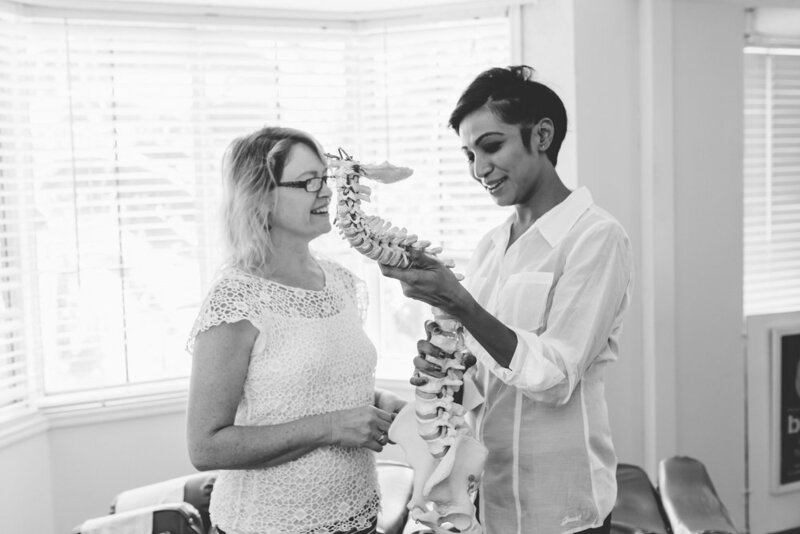 Some well researched benefits of chiropractic care can be found on the Australian Spinal Research Foundation website, take a look and see the myriad of ways chiropractic has been found to help people. Legend says the Chiropractic profession was founded on a story of a deaf man receiving an adjustment and subsequently recovering his hearing! If you want to know if chiropractic can help your spinal -health issues as well as assist your overall spinal wellness, you can get in contact with us or book in for a FREE spinal assessment. To look at chiropractic related research studies, contact spinalresearch.com.au for more information. For a little more information on the health conditions we treat including but not limited to the ones listed above click here. Our chiropractors are highly trained in various techniques including manual adjustments, Gonstead, TRT, NET, applied kinesiology, Trigger Point Release. If you have prior knowledge of the techniques that you prefer, please let us know so we can match you with the best practitioner for you. Please note our chiropractors have lots of experience and always apply safe and gentle practices, so much so that many find their adjustments to be relaxing! On your initial consult we usually allow an hour to take the time to really get to know you and your body. We take the time to properly examine and test your body as well as getting a understanding of your medical history. You are welcome to bring any recently acquired X-rays, MRI or any other health assessments you may think are relevant. Our aim is to be safe, thorough and effective. If you have specific health conditions or other issues, the chiropractor will take them into account when deciding on your care. These assessments help the chiropractor to evaluate any special needs you may have and to ensure your safety and comfort during the process. We do not always adjust on the first visit, it depends on what has brought you to us in the first place, and what is presenting on the day and if it would be safe to do so without further reports. Sometimes we request X-rays, again, this would be done for safety reasons. Your second visit is a little bit shorter, about half an hour, in which the doctor will go through all the findings of the previous visit and discuss their recommendations for your individual wellness and progress. You get to ask any questions that may have arisen since your last visit. Depending on the recommendations presented in the report visit combined with your presenting state and needs will help determine your treatment plan. Chiropractic care for pregnant women, nursing mothers, babies and children is offered by our chiropractors. Our pregnant patients often arrive early just to spend extra time on the special adjustable table. Techniques for young patients are specialised & adapted to provide safety & effectiveness. We recommend reading Well Adjusted Babies by Dr Jennifer Barham-Floreani for more information on the benefits of chiropractic care for both mum's, bubs and kids. We often have a copy in clinic available to borrow.